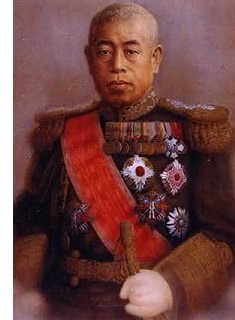 Isoroku Yamamoto (1884-1943) - Japanese admiral who engineered the attack on Pearl Harbor, and commanded the Combined Fleet during Second World War. He graduated from the Imperial Naval Academy in 1904, at the same time Japan's other national naval hero, Tōgō Heihachirō, was commander-in-chief of the Russo-Japanese War. After graduation, he gained valuable combat experience aboard the cruiser Nisshin in the decisive Battle of Tsushima. But the battle cost him two fingers on his left hand. After the war, he attended the Naval War School, which was a type of graduate program for naval officers, and emerged as a Lieutenant Commander. Like Tōgō, he lived in the West for a short period of time and, likewise, learned to speak fluent English. From 1919-1921, he studied at Harvard University in the United States, followed by service as a military attaché in Washington D.C.. As a result, Yamamoto became familiar with American culture, business and, most importantly, military tactics. In 1923 he was promoted to Captain and, the following year, shifted his area of expertise from gunnery to naval aviation. This was an important move as Yamamoto is considered a pioneer in naval aviation combat. In the late twenties he commanded the aircraft carrier Akagi. When World War II broke out, Japan stood virtually unopposed in the Pacific. However, when it wanted to add the Philippine Islands to its empire, military officials feared it would provoke a response from the United States. The Japanese High Command decided to try to destroy America's will to fight by delivering a "knockout" blow first. It would come at Pearl Harbor. Although Yamamoto warned of the US's industrial might, he took charge of planning the attack. After its successful execution, Yamamoto was reported to have said, "I fear all we have done today is awaken a great, sleeping giant and fill him with a terrible resolve." His words were proven true about six months later when the two navies met at the Battle of Midway. It was a decisive victory for the United States, one from which Japan never really recovered. Yamamoto's role in the war ended the following year when he was killed after the plane in which he was flying was shot down over Papua New Guinea by the United States.